This weekend's Mystery Foto showed the importance of the Vanderbilt Cup Races to the drivers of the era. -Identify the Vanderbilt Cup Race and why the driver was so upset and so in despair. The 1910 Vanderbilt Cup Race. During the 8th lap, the chain broke on his racer. Out of the race, Arthur collapsed in despair, perhaps, foreshadowing bouts of depression which he would suffer for the rest of his life. Congrats to Greg O., Robert Greenhaus, Art Kleiner, Steve Lucas, Frank Femenias and Ariejan Bos for correctly identifying Arthur Chevrolet and the Marquette-Buick. 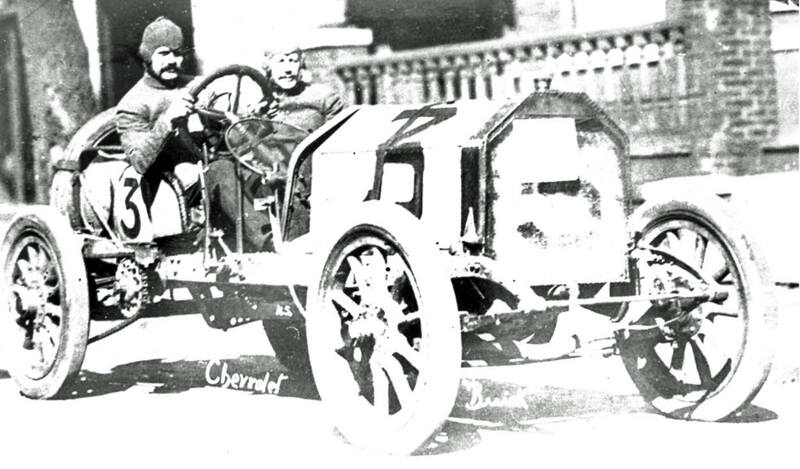 Arthur Chevrolet (center,1884-1946) was the middle brother of Louis Chevrolet (left,1878–1941) and Gaston Chevrolet (right,1892–1920). After brother Louis immigrated to America and earned enough money, he sent for Gaston and Arthur to join him. Once there, Arthur worked as an automotive mechanic and joined his brothers in automobile racing. 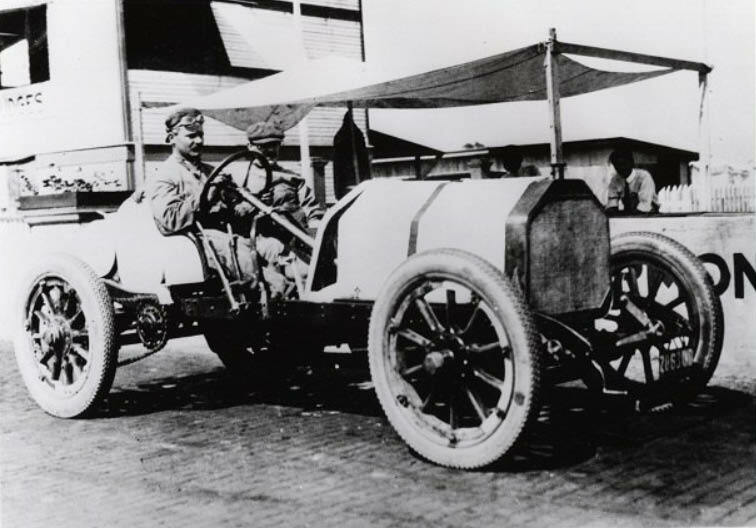 Arthur’s first three races were held at the Indianapolis Speedway on May 28, 1910 (finishing 4th in a Buick), July 2, 1910 (finishing 4th in a Marquette-Buick) and July 4, 1910 (finishing 5th in a Marquette-Buick). When he was not driving, Arthur worked on Louis’ Buick Bug (standing to the right of the driver’s seat). Like his brother Louis, Arthur drove a Marquette-Buick in the race. Arthur on the Long Island Motor Parkway approaching the Merrick Avenue Bridge. The Meadow Brook Lodge can be seen on the left. 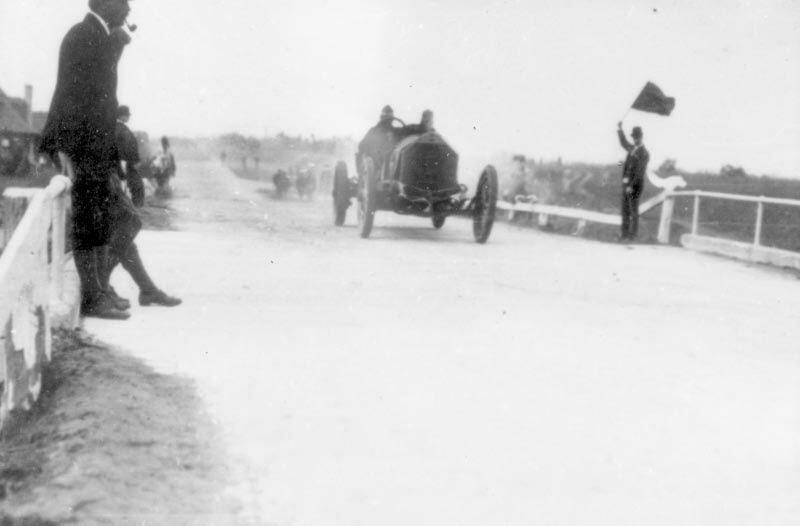 During the 8th lap of the 22-lap race, the chain broke on the Marquette-Buick. Out of the race, Arthur collapsed in despair, finishing 27th of the 30 entries. Arthur drove the #16 Buick in the inaugural Indy 500. The #16 Marquette-Buick started in the third row. After 30 laps, a broken crankshaft forced Chevrolet from the race. He finished 36th of the 40 entries. Arthur’s driving career ended during practice for the 1920 Indy 500 when he was severely injured in a crash. His brother Gaston (left) went on to win the race in a Monroe-Frontenac. However, a few months later Gaston was killed when he crashed on lap #146 of a Los Angeles Speedway race in Beverly Hills, California. 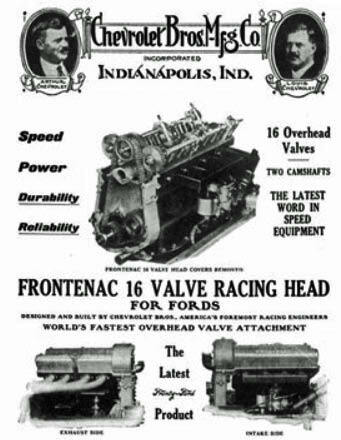 In the 1920′s, Arthur and Louis owned the Chevrolet Brothers Manufacturing Company in Indianapolis that made cylinder heads for Fords and racing cars called Fronty-Fords. The Fronty-Ford creations consistently won at smaller race tracks across the country. In seven years, the company filled over 10,000 orders for cylinder heads and race cars. In 1928, Arthur filed with the US Patent Office for an “Overhead Valve Engine" and was awarded a patent on January 21, 1930. 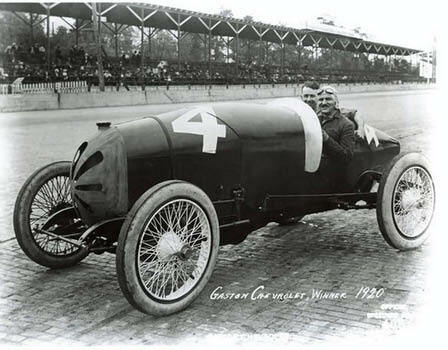 Arthur Chevrolet also began building sprint type race cars and became one of the pioneer leaders in that field. In 1990, his efforts were recognized when he and his brother Louis were named to the National Sprint Car Hall of Fame & Museum. In 1929 Louis and Arthur Chevrolet left the auto business altogether to form the Chevrolet Brothers Aircraft Company. 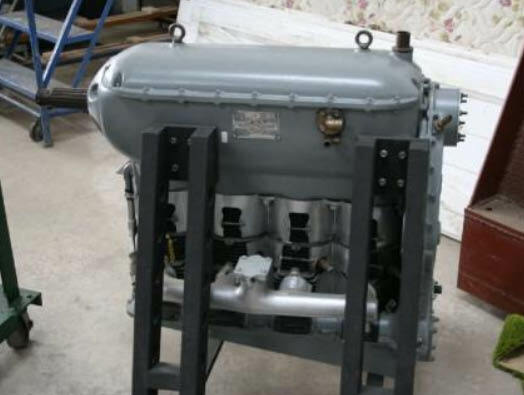 They began producing and efficient aircraft engine called the Chevrolair 333. With the stock market crash, the brother lost the company to a Baltimore investor Glenn L. Martin who built a successful company around the engine. Despite Arthur’s talent for design and engineering, he had little talent for business and was often pushed out of the endeavors before he could reap the rewards. Arthur was financially broke and suffering from bouts of debilitating depression. He moved to Slidell, Louisiana to work as a master mechanic for the Higgins Engine Company. Four years later, he committed suicide, only nine days short of his 62nd birthday. 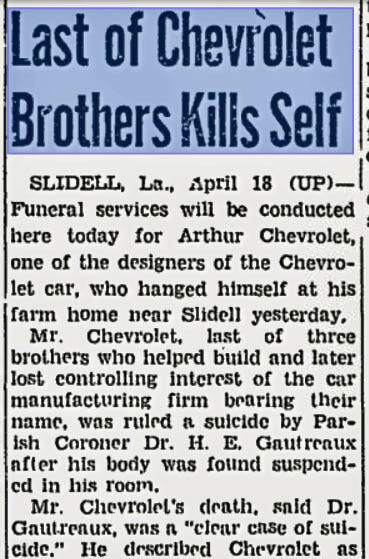 Until recently, it was assumed that Arthur Chevrolet was buried next to his brothers in an unmarked grave in Holy Cross Cemetery in Indianapolis. However, research indicated that he was actually buried in Slidell, Louisiana. 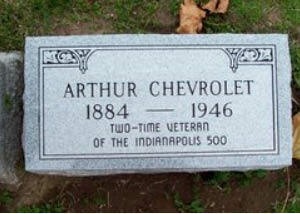 On Nov. 3, 2011, 100 years to the day after the founding of the Chevrolet Motor Co., the Indianapolis Motor Speedway, in conjunction with a local mortuary, furnished this cenotaph honoring Arthur Chevrolet near the headstones of his brothers in Indianapolis. 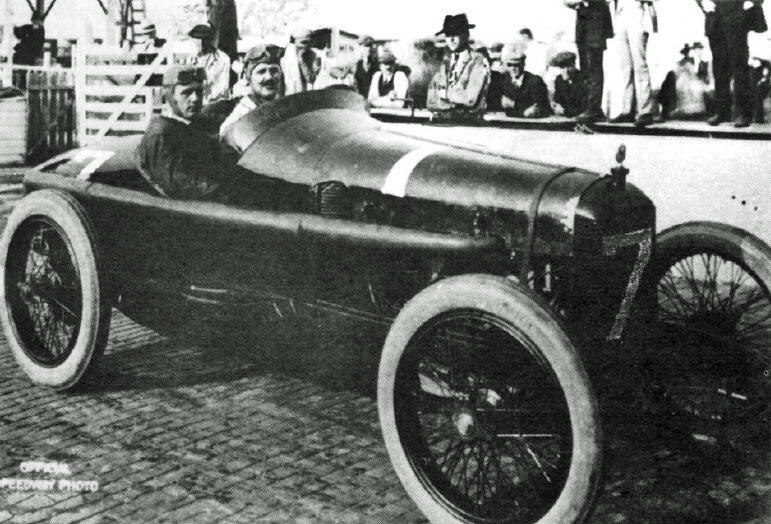 The racing record of Arthur Chevrolet. The 1910 Vanderbilt Cup Race. Arthur Chevrolet broke a driving chain during lap 8. He was forced to quit. The driver is Arthur Chevrolet. The car is a Marquette-Buick. The race is the 1910 Vanderbilt Cup. Mr Chevrolet’s despair was due to his being forced out of the race after breaking a drive chain on the 8th lap. Arthur Chevrolet, brother of Louis Chevrolet. Mechanician was Bob Evans. 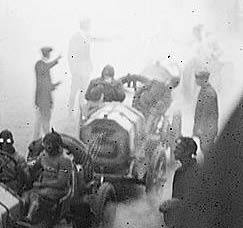 1910 Vanderbilt Cup Race - during lap 8 the car broke a driving chain, ultimately finishing 25th. Not a good day for Arthur, hence his despair! 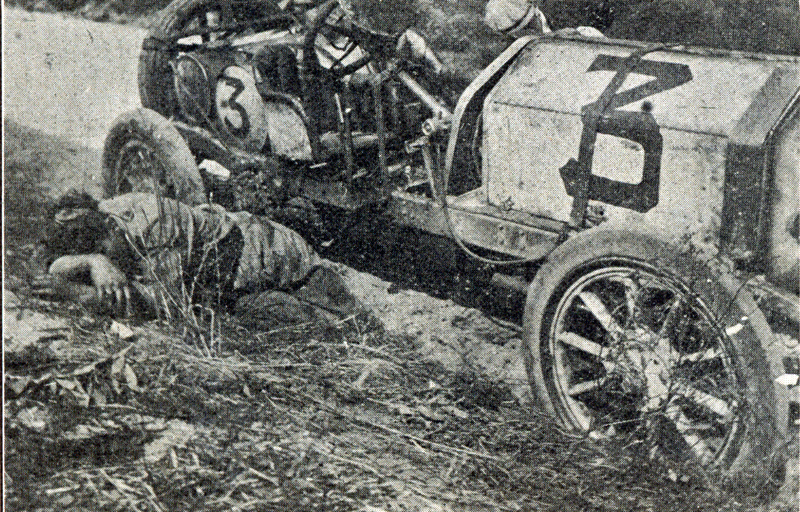 That’s Arthur Chevrolet (brother of Louis & Gaston) lying on the side of the road during the 1910 Vanderbilt Cup Race. He was distraught over the fact that the #3 Marquette-Buick he was driving broke a chain and he was forced to quit the race while on lap #8. Driver anguishing because his car ditched at manhasset striking a telephone pole on the first lap of the event. With all that can possibly go wrong mechanically with a racer, a drive chain! What are the odds? 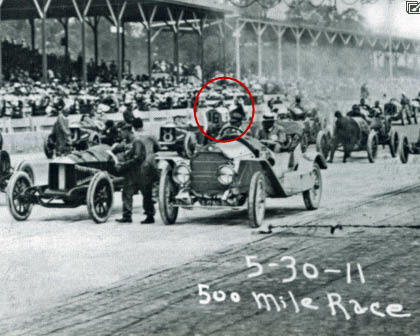 The disappointed man is Arthur Chevrolet, driving a Marquette-Buick during the 1910 Vanderbilt Cup race (like his brother Louis). Arthur was (as stated by Automobile Topics issue of Oct. 8) “a perfect likeness of his famous brother [Louis], except for a brown moustache in place of a black one”. During the 8th round he fell out with a broken driving chain and a doubled radius rod (again according to Automobile Topics). Which apparently was quite a blow! Eventually none of the three Marquette-Buicks (Bob Burman was driving the third car) would make it to the finish. 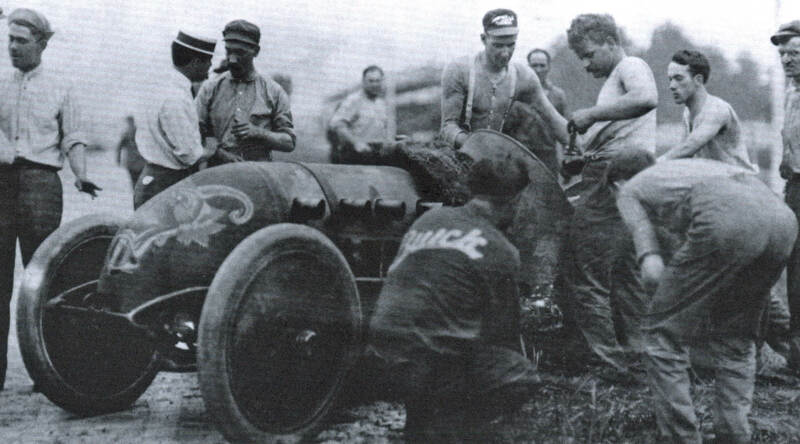 Although Louis Chevrolet and Bob Burman even took 1st and 2nd place from the 3rd to the 9th round, Burman’s car was forced out by radiator problems in the 10th round and Chevrolet’s car ran off the road shortly after a pit stop at the end of the 15th round. In this incident his mechanic Charles Miller was killed almost instantly. I am curious if there is a copyright for this image, or a source at least. Please let me know where you found it! Brian, there is no copyright on this image. I will send you a jpeg.